Release Date: September 22nd, 2006 by Paramount Pictures. BASIC PREMISE: Johnny Knoxville and his crew of Jackasses return to perform more shocking, dangerous stunts. ENTERTAINMENT VALUE: Just as expected, Johnny Knoxville and his crew do a variety of crazy stunts that range unimaginably disgusting to very dangerous to laugh-out-loud funny. Knoxville dresses up as an old man walking around with a fake nut-sack dangling out of his pants. The rest of the crew includes many others such as Steve-O, Chris Pontius and Bam Margera. In one scene, somebody drinks a liquid that cannot be described here without a handy barf bag. Other stunts will not be spoiled here, but keep in mind that they’re just as low-brow—but it all does exactly what it intends to do which is to shock, to disgust and to make you laugh. 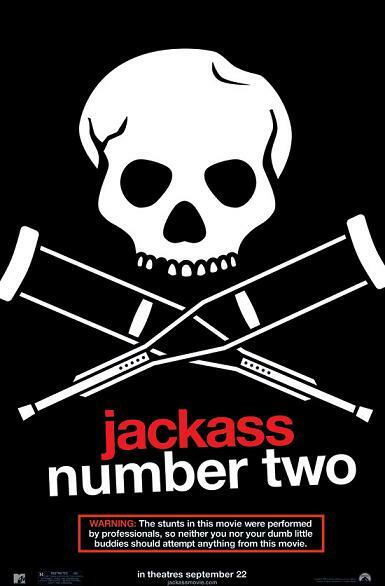 Fans of the first Jackass movie will undeniably be entertained by this consistently vulgar and intentionally offensive, yet hilarious sequel. Just don’t mistake this for a date movie. INSULT TO YOUR INTELLIGENCE: None, as long as you check your brain at the door. IN A NUTSHELL: Consistently vulgar, offensive and outrageously funny.